Where can I find the license details? See the Terms and Conditions page for license details. The license doesn't cover what I want to use it for - can I get a custom license? In many cases yes - contact me via the Contact Page and let me know how you would like to use a product. Can I get a refund after purchase? Unfortunately no because all products are downloadable without any ability to restrict access following download. Can I include some content in assets that I want to sell? The license doesn't cover that but please contact me via the Contact Page and describe what you have in mind and maybe we can come to an agreement. Licenses are described on the Terms and Conditions page. Most licenses are 'per user' and it doesn’t matter how many computers you use it on. If you are a game studio and one person does the sound effects, then it's sufficient to have one license for the sound effect pack (same goes for images, game assets, music, etc). Can I use the products I buy in commercial games? Can I transfer or sell my license if I don't need or use the products anymore? No, licenses can not be sold or transferred. Payments are made either using debit/credit card (via Stripe payment processor) or PayPal. No, Imphenzia never stores or even sees the card details. Payments are processed by well known and secure payment processors; Stripe and PayPal. Yes, the web server is using SSL/TLS encryption and so are all the integrations to the shopping cart (via sendowl.com) payment processors (Stripe and Paypal). Outside European Union: No. Inside European Union: Yes, but you can submit your company VAT registration number, if you have one, to deduct the tax during checkout. How do I download the products after purchase? The files are delivered through a service called SendOwl (sendowl.com) and are hosted on Amazon S3 for reliable delivery. Upon purchase you will be-redirected to a download page (a link will also be sent to the e-mail address used during purchase) where you can download the files. The links don't expire any specific date but you will be allowed to download the file 10 times if you run into any problems with your internet connection. Still, if you experience any problem - just contact me. How long will I be able to download the products? Most products don't have a time limit for but there is a 10 time download limit to prevent links from being spread in an illegal manner. If you you experienced any problems while downloading, Contact Me to have the download limit lifted. The exception is access to Music for Fans - the download links are valid for 48 hours and can be re-activated twice by default and in more times in the future if you contact me. My download links have expired, can you help me? Yes, contact me with your order number. It depends on the product, packages range from a few megabyte in size to many gigabites for large sound effect packages. Most sizes should be described on the product pages. I have changed my e-mail address since I bought products - can you change it for me? Yes, contact me with order number and I can update the e-mail address so future updates are sent to your new address. What file format are the sound effect packs in? All sound effects are in the WAV/Wave file format. Game-Ready sound effects are 44.1 kHz 16 bit and Sound Design packs contain 192 (or 96) kHz 24 bit sounds. What file format is the music in? All music is delivered in WAV/Wave file format at a quality of 44.1 kHz 16 bit stereo. What file format are the spaceboxes in? SpaceBox HD and ST files are PNG files and SpaceBox PRO are layered TIFF files. What file format is SPACE for Unity in? SPACE for Unity is delivered as a .unitypackage file, roughly 500MB in size, that you import into Unity. What file format is Space Fabricator in? How does a spacebox compare to a skydome/sphere? A spacebox is the same as a space themed skybox which has less distortion compared to sky domes and spheres. Although cube mapping can be applied to spheres, a cube requires less much geometry so a distortion compensated cube is the most optimal solution in terms of performance, image quality and distortion. How is performance of SpaceBox ST and SpaceBoxHD in game engines? SpaceBox HD generally requires 6 draw calls since it’s created from 6 separate images. At high resolution such as 4096x4096 a fair amount of bandwidth from texture memory is used. Still, at high resolutions on computers rendering a SpaceBox HD requires very little processing power. SpaceBox ST consists of a single 4096x4096 texture so only 1 draw call is needed. This is the absolute fastest way to draw a space environment of such quality compared to any other method. How is a spacebox different from a skybox? There is no technical difference. Spacebox is just a short version of saying 'space skybox'. How are the spaceboxes created? The art elements are hand painted in PhotoShop and seamless 3D noise is mathematically generated using Simplex algorithm. Can I use spaceboxes in commercial games? Can I sell spaceboxes for others to use? No. You can not sell or distribute the spaceboxes for anyone else to use. Can I buy unique/custom spaceboxes? Contact me if you have special requests for spaceboxes. Depending on complexity and needs, unique/custom spaceboxes in HD, ST, and PRO format ranges between US$100 - $1000. What are the resolution of spaceboxes? SpaceBox HD are 6 images, one for each side of the box, each with a resolution of 4096x4096 for a total of 100 megapixels. SpaceBox ST is a single 4096x4096 image totalling about 16 megapixels. SpaceBox PRO is a single image with a resolution of 16384x12288 where the six sides have been arranged in a horizontal cross configuration and each side is 4096x4096. How large (file size) are the spaceboxes? SpaceBox HD are sized about 15-30MB depending on complexity and consist of 6 lossless compressed PNG files. SpaceBox ST are sized about 4-10 MB and consists of a single lossless compressed PNG file. SpaceBox PRO are sized about 150-400 MB (not for use in games) and consists of a single lossless compressed layered TIFF file. Can I modify the spaceboxes to suit my needs? Are you using SpaceScape and making money from it, that is terrible!? Can I run SPACE for Unity in standalone mode? No. SPACE for Unity requires that you use Unity 3D. Can I use SPACE for Unity in commercial games? What do I receive when I buy SPACE for Unity? What is the quality of the game-ready sounds? All sound effects are 16 bit 44.1 kHz. There is no 'clipping' of any sounds and noise levels are kept to an absolute minimum by using professional quality equipment to record the source material. Looping sounds are provided, to best ability, without any audible seams. All sounds always start and stop at 0 dB to ensure that there is no click when playback begins. The sounds are cropped and unecessary long trails have been removed to conserve memory usage and size of game distributable. In what file format are the game-ready sounds provided? Game-ready Sound Packs are delivered as zip archives containing uncompressed 16 bit 44.1 kHz WAV files. The term "game-ready" indicates that they are optimized as much as possible for direct implementation in games. The quality isn't unecessarily high (e.g. as 24 bit 96/192 kHz, mainly required when manipulating sounds in a sound design process.) Game developers may drag-and-drop these sounds into their game development tool of choice. What does an "evolving" sound pack mean? 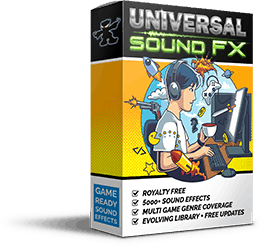 Universal Sound FX is a sound effects pack that is updated every quarter with new sound effects. The term "evolving" refers to that the pack improves with better sounds and wider game genre coverage. As the pack evolves the price of the pack increases but existing customers get the updated pack for free. It pays off to buy Universal Sound FX as soon as possible to benefit from future updates without any additional fees. What are "specialized" sound packs? Specialized sound packs covers a particular topic or game genre in much more detail than Universal Sound FX (USFX). USFX may, for example, contain 200 user interface sounds whereas the specialized UI Sound Pack contains 3000 user interface sounds with many more variations. The specialized sound packs are not evolving (updated) like USFX , instead additional volumes of specialized sound packs may be released. How do I receive notification when Universal Sound FX (USFX) is updated? An email will be sent to the email addressed used during the PayPal payment process. If you have changed your email address. If you have changed your e-mail address, see 'How do I change my email address to receive Universal Sound FX updates?'. How do I change my email address to receive Universal Sound FX updates? Use the contact page to requests to change the email address (make sure to include old and new address and the purchase order number.) If you subscribe to newsletters you will also receive separate notification of USFX updates. Why are there often similar sound effects with the letters RR in the name? Sounds that are frequently repeated, such as footsteps or firing weapons, sound very artificial if the same sound is repeated without any alteration. Repetative sounds are provided with multiple 'Round Robin' (RR) variations so you can playback different versions of the sound to make it sound more natural. What are the differences between the sound effect packs sold on imphenzia.com compared to the Unity Asset Store and Unreal Marketplace? Only the game-ready sound effects are available in the Unity Asset Store and Unreal Marketplace (not the sound design packs.) The packs provided via this web site are delivered as zip-files containing WAV files. The Unity Asset Store versions of sound packs are delivered as an importable Unity asset with sounds which are keyword tagged using Unity labels. The Unreal Marketplace versions come as Unreal Projects with .uasset files instead of WAV-files. The asset is priced differently in different stores depending on how much effort is involved in maintaining the product in the store, how large share the store takes from the sale price, and how other assets are priced in the stores not to undercut competition too much. In what file format are the sound design sound effects provided? Sound Design Packs are delivered as ZIP-archives containing 24 bit WAV files with in 96 kHz or 192 kHz. The files are meta tagged with appropriate keywords and useful meta data details. What is the quality of the sound-design audio files? The sound design audio files are either 96 kHz or 192 kHz 24 bit audio WAV files. Recorded sounds are recorded using professional low noise recording equipment. How do I receive notification when new sound packs are released? If you subscribe to newsletters, and make sure to tick the Sound Effects tickbox, you will receive email notification of new sound packs as they are released. Are all sound effects created by you? Yes. Source material is recorded or generated using sound synthesis and the sound effects are designed by me. How can you sell the sound effect packs so cheap? I want to make sure independent game developers who are on an extremely tight budget can use sound effects without having to purchase expensive libraries or individual sound effects. Since my audience is wide and the price is very competitive I aim to sell more copies to make a sustainable business rather then selling the sounds expensive to a smaller number of customers. Do the sound effects come with meta data tags? Yes, all sounds have keywords and other meta data tags.